For proper point fastening, 1" neoprene bonded washers should be used with screws. 48 inch wide sheets: Should be fastened to supports at all four corners , and at points 6" in from the edges of each purlin support. 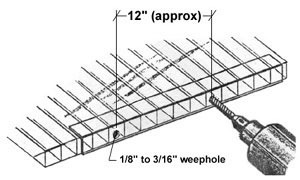 72 inch wide sheets: Should be fastened to supports at all four corners, and at points 6" in from the edges of each purlin support and in the center of the purlin supports. Allow for thermal expansion during installation at a rate of 1/8" per 3 feet at 100 temperature differentials in both width and length of the sheet. Bronze panels will require an additional 30% space. Twinwall is one of the highest impact resistant materials available. From transport to installation, Twinwall will maintain its durability. Even when exposed to elevated temperatures over a long period of time, it will maintain its structural integrity. On-site, it will not crack or splinter, assuring you a high degree of safety. Extruded ribs shall be installed in a vertical direction for drainage. Glazing sheets should be joined by Twinwall extruded polycarbonate profiles and be installed with their protective U.V. stabilized surface towards the exterior. Twinwall should not be used with PVC profiles, however, a variety of aluminum systems may be used. Consult with your local Distributor for approved systems. For proper application of Twinwall in roofing conditions, a slope of at least 5 degrees is required. Stiff fixing by means of adhesive or putty is to be avoided. Contact your distributor for recommended sealants. Exposed top and bottom ends of a sheet must always be sealed by means of the proper polycarbonate "U" profiles or an adhesive aluminum tape to prevent dust and dirt penetrating inside the ribs. Min. Bend Radius 2'-2" 2'-11" 3'-11" 7'-10"
Correct calculation of expansion in order to provide for the necessary allowance in the framing. The thermal expansion co efficient is 0.0000375 in/inF. 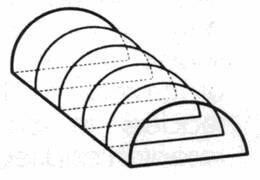 Where possible install the sheets with the ribs running vertically and following bending in bent applications. Washers and sealing materials must be compatible with polycarbonate. 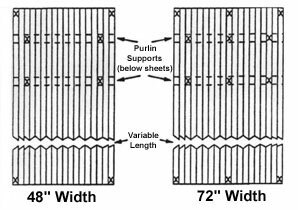 The charts below are meant only to show approximate loads that the polycarbonate multiwall can expect to sustain under the given circumstances. 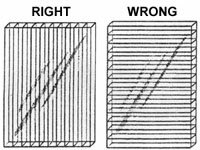 The charts do not reflect the capability of your buildings super structure (i.e. framing, footings and general design) to withstand loading. To insure that your building is able to withstand the expected loads in your area, contact your local building inspectors or designer.